A phony psychic's girlfriend finds out that a lump on her back is a growing reincarnation of a 400 year-old demonic Native American spirit. If 1978’s The Manitou doesn’t fit in the category of long-forgotten horror flicks, what does? Someone must remember it, however, or else this Blu-ray wouldn’t reside in my player. When Karen Tandy (Susan Strasberg) suffers from a rapidly-growing tumor on her neck, she visits the hospital. Doctors soon deduce that an actual fetus develops inside this lump. And not just any fetus, as Karen hosts the spirit of an ancient Native American demon called the Manitou. Karen’s ex-boyfriend Harry Erskine (Tony Curtis) travels to South Dakota to enlist the assistance of John Singing Rock (Michael Ansara) in an attempt to save Karen and stop the Manitou. If you look at the Blu-ray’s cover art – which appears to replicate the theatrical poster – you may sense hints of other films. 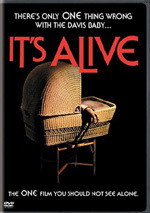 The imagery reminds me a lot of the ads for 1974’s It’s Alive and I see hints of Exorcist as well. I suspect these allusions didn’t happen accidentally, as I’m sure those behind Manitou wanted to echo those earlier hits. It didn’t help, as it appears the movie barely received a theatrical release. This surprises me somewhat, if just because Manitou boasts some actual “name” actors. Granted, stars like Curtis, Stella Stevens, Ann Sothern and Burgess Meredith might not have been huge draws, but it feels like they should’ve been enough for some kind of sales push. Whatever reason caused Manitou to receive so little distribution, it may have been an act of kindness for those actors. Thoroughly silly and awful, the film leaves none of its participants unscathed. It shouldn’t shock anyone that a movie about a tumorous fetus offers a goofy experience, but the problem stems from the manner in which director William Girdler explores the material. Rather than play up the lunacy for all the over the top camp the concept merits, Manitou takes things seriously. Really seriously, as nary a hint of audience-winking emerges here. Sure, the film shoots for some laughs via Harry’s fake psychic routine, but otherwise, the flick never betrays a sense of humor or self-awareness. Burdened with such a straight face, the movie can’t get off the ground. The plot moves at a glacial pace and we never invest much in the characters. This means the film mopes and meanders its way through its 103 minutes. None of the attempts at scares go anywhere, as they’re more likely to inspire mocking laughter than actual scares. All of this means Manitou deserved its obscurity over the last 40 years. Nothing here works and the movie becomes a boring mediocrity. The Manitou appears in an aspect ratio of approximately 2.35:1 on this Blu-ray Disc. Though not bad, the image seemed mediocre. Sharpness became an issue, as an awful lot of the film appeared soft and tentative. At best, delineation appeared reasonably positive, but this never became an especially well-defined presentation. Neither jagged edges nor moiré effects materialized, and I saw no edge haloes. In terms of print flaws, I saw occasional spots and specks throughout the film, though not to a dominant degree. Colors veered toward the bland side of the street, as the movie’s earthy palette lacked much impact. The hues showed acceptable clarity but no better than that. Blacks tended to seem somewhat inky, while shadows usually appeared a bit thick. This was a dated and dull presentation. I didn’t experience anything much more impressive via the film’s mediocre DTS-HD MA stereo soundtrack, as it lacked punch. Speech seemed somewhat stiff, but the lines remained intelligible and lacked edginess. Music showed acceptable definition, but the score lacked range and felt a bit dull. The same went for effects, as they remained accurate enough but they didn’t deliver much obvious impact. In terms of imaging, music showed pretty good stereo spread, but effects didn’t provide especially accurate localization or movement. Though these elements broadened across the front, they lacked a convincing feel. Ultimately, this turned into a decent track. The Blu-ray brings a few extras, and we open with an audio commentary from film historian Troy Howarth. He presents a running, screen-specific look at the source novel and its adaptation, story/characters, cast/crew and related domains. I’ve enjoyed prior Howarth commentaries and this becomes another good one. Howarth touches on a useful array of subjects, and he especially digs into comparisons between the novel and the film. Howarth proves bright and engaging during this strong discussion. Two featurettes follow, and the first provides an interview with producer David Sheldon. In this 11-minute reel, Sheldon covers aspects of his career and his work with director William Girdler. We don’t learn much about Manitou but Girdler offers a decent overview of his time in films. Next comes a 28-minute, 11-second interview with writer Graham Masterson. He chats about what led him to become a writer and his various efforts. Much of this follows the same path as Sheldon’s piece, but Masterson spends more time with Manitou itself, so this turns into a useful discussion. In addition to a trailer and three TV spots, we finish with an Image Gallery. It shows 94 stills that mix shots from the movie and publicity elements. The Gallery brings a nice array of elements. If anyone hopes to find a lost horror classic via 1978’s The Manitou, forget about it. The movie comes with some familiar faces but the ridiculous story and overly self-serious presentation make it a ludicrous dud. The Blu-ray comes with mediocre picture and audio as well as supplements highlighted by a very good commentary. Manitou never gets off the ground.